Potato bars, nacho bars… everyone loves to customize their own food. 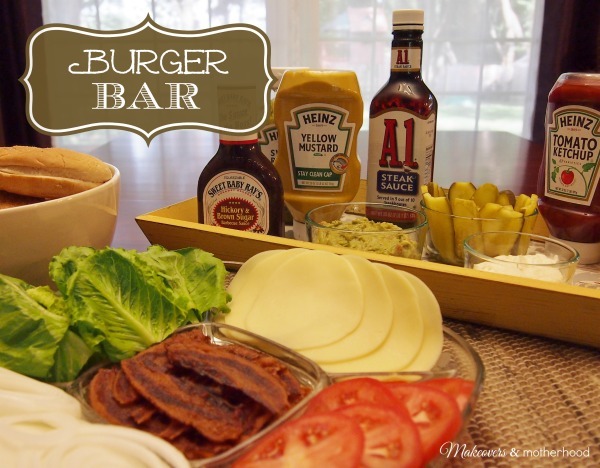 So why not make a burger bar and have your guests “Build a Burger” at your next backyard BBQ?! Adding a few more burger topping options can add a lot more fun and flavor to a plain old burger. Having guests build a burger allows those who like to keep it simple happy yet allows foodies to get creative! Veggies. Eating some veggies on your burger is a delicious and sneaky way to get another serving of vegetables in your diet! Bacon. It’s a category on it’s own! Oh how I love bacon! Microwave a platter of bacon or cook it in the oven (so you don’t have to worry about cleaning up bacon splatter), break it in half, and serve. It’s okay if it’s not piping hot. It’ll be added to a hot sandwich and with the cold condiments, no one will even notice. BUILD A BURGER – Go crazy and create your own! While the burger bar should be the highlight of your food spread, coordinating side dishes, desserts, drinks, and adult beverages will round out your dinner nicely. And your burger bar will make for an awesome backyard BBQ that everyone will love! This is a great idea for a summer party. I love it!